ImplantPilot™ is a revolutionary new system developed to increase the precision of implant placement whilst being less invasive and thus reducing discomfort for you as a patient. It takes advantage of the latest digital technology to plan the implant placement virtually well in advance of the actual procedure. The planning establishes the final appearance of the teeth then makes the implant positions correspond to that, so a predictable final result can be achieved. 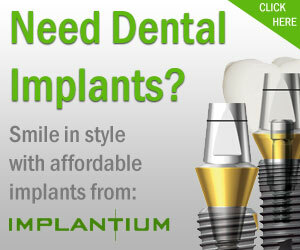 It opens up the possibility of placing implants and attaching prefabricated teeth at the same appointment. The digital planning combines a three-dimensional CT scan with a scan of a plaster model and then relates the two by use of a marker on both scans. The planning software is used to design a guide which is 3D printed in titanium. This guide controls the position of the drill, which in turn gives the precise implant placement. The guides that are fabricated are unique to every patient. Conventional implant treatment requires the gums to be cut and folded back to be able to see the bone at the implant site. Using ImplantPilot™ keyhole technique there is much less tissue damage and so less post-operative discomfort. No sutures are required. There is less risk of bleeding and the procedure can usually be completed in a fraction of the time. 1. An impression is taken of your mouth, and with the impression still in place in your mouth a CT scan is taken. 2. The impression is used to cast a plaster model and this is then scanned. 3. The CT scan data and the model scans are loaded into the software and the position of the implants carefully planned. 4. From this data a metal guide is fabricated, which ensures a precise implant placement. Because of the pre-planning the whole process typically takes half the time of conventional implant placement and results in far less stress and post-operative discomfort for patients. ← How SENSITIVE are you?